In some instances, simply being a community advocate for local workers’ rights is what it takes to further establish the IUPAT positive force, and a way of life, for local residents. Wage theft, the illegal practice of not paying workers for all of their work by violating minimum wage laws, not paying overtime, denying them breaks and making them work off the clock, is a major problem in the United States. 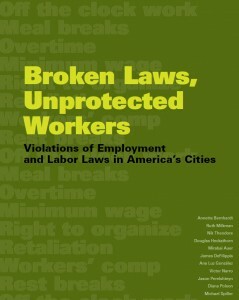 Download this study on wage theft here. Fully 26 percent of workers were paid less than the legally required minimum wage in the previous work week. More than a quarter of respondents worked more than 40 hours during the previous week. Of those, 76 percent were not paid the legally required overtime rate by their employers. Women were significantly more likely than men to experience minimum wage violations, and foreign-born workers were nearly twice as likely as their U.S.-born counterparts to have a minimum wage violation. Foreign-born Latino workers had the highest minimum wage violation rates of any racial/ethnic group. But among U.S.-born workers, there were significant race differences: African-American workers had a violation rate triple that of their white counterparts. Some 86 percent of respondents worked sufficient consecutive hours to be legally entitled to at least one meal break during the previous week. Of these workers, more than two-thirds (69 percent) received no break at all, had their break shortened, were interrupted by their employer, or worked during the break—all of which constitute a violation of meal break law. The International Union of Painters and Allied Trades has dedicated itself to representing workers who are victims of this crime. A crime that not only affects the workers, but also affects honest companies and their ability to compete in their market. These crimes have a measurably negative effect on the means for signatory employers to win projects and jobs for IUPAT members and other union workers. They simply cannot compete with the price points achieved by dishonest and exploitive employers. As a result, markets that were once considered strong “union markets,” are now falling to non-union contractors. Recently, in the Pacific Northwest, IUPAT District Council 5 had contact with nearly 1,000 unrepresented craft workers. Its representatives, and community partners, recovered approximately $400,000 in back wages for those workers. This doesn’t include the case where the employees of a single drywall contractor were awarded $500,00 because the employer failed to pay overtime. The IUPAT also collected over $100,000 in attorney fees on their behalf. Moreover, these efforts have also recovered tens of thousands of work hours for the members of DC 5. In fact, the level and quality of evidence of employee exploitation amassed by DC 5 has enabled the IUPAT to develop a relationship with a special division of the U.S. Department of Labor to assist in the efforts. In addition to our legal strategy for these workers, DC 5 is also working to organize them. Not only have the efforts of DC 5 exposed the crimes of exploitative contractors and made IUPAT contractors more competitive in the market as a result, those efforts are now growing our union, as well. We have accomplished this by proving to them, and the communities in which we live, that we’re an organization that protects workers’ rights. Are you a victim or do you know a victim of wage theft? 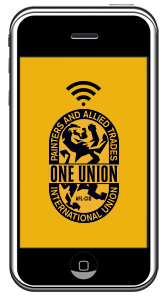 Contact the IUPAT HERE.